Pin It One hundred years ago, 781 Japanese immigrants arrived at the Brazilian port of Santos on the steamship Kasato Maru. They were the first of many more to come and try life in the warm, rich Brazilian lands. They were hired mainly to work on the coffee plantations. Today Brazil has the largest Japanese population outside of Japan (1.5 million). As is a full circle of life, since the 80s, over 300 000 Brazilians emigrated back to Japan to work on factories, mainly. Brazil and Japan share a long relationship, and the Japanese influence can be noticed anywhere in Brazil, but it is more evident in the states of Sao Paulo and Parana, where the first immigrants arrived, and where I come from. This post contributes to an event created by Akemi, a Brazilian blogging from Japan. The idea of this event is to showcase dishes that use Japanese ingredients. 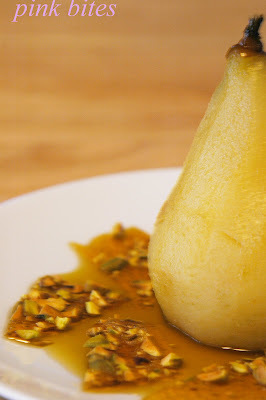 I chose those pears that are poached in green tea. The Japanese have been drinking green tea for centuries. Here in the Western world, we just recently discovered the wonders of this tea. The pistachio brittle is optional, but it makes a nice presentation and add a new level of texture to the dish. Bring 6 cups water to a boil in a large saucepan. Cut out a parchment-paper circle the diameter of your saucepan; set aside. Add tea bags to boiling water, remove saucepan from heat, and let steep for 10 minutes. Remove tea bags, squeezing excess liquid into the saucepan, and discard. Add sugar, ginger, orange peel, vanilla pod and seeds to the tea; stir to dissolve sugar. Bring tea mixture to a simmer over medium high heat; cook 5 minutes. Meanwhile, peel pears, leaving stems intact. Using a melon baller, scoop out the seeds and core from the bottom of each pear. 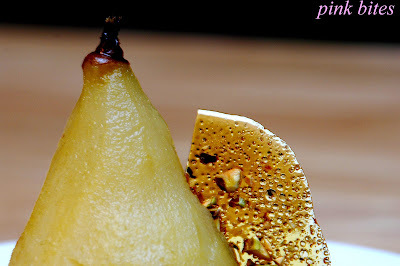 Add pears to saucepan; reduce heat maintaining a gentle simmer. Cover pears with the parchment-paper circle to keep them submerged. Cook until just tender, about 20 minutes. 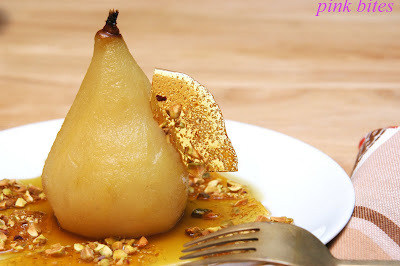 Using a slotted spoon, remove pears. Strain cooking liquid; discard solids. Return cooking liquid to saucepan. Bring to a boil over medium-high heat. Cook until reduced to 1 cup, about 30 minutes. Combine sugar, honey, and 2 tablespoons water in a small saucepan over medium-high heat. Bring to a boil without stirring, and cook until deep golden brown, 4 to 5 minutes. Pour onto prepared baking sheet. Immediately sprinkle evenly with pistachios and salt. Let cool completely.